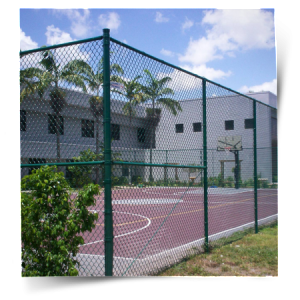 Fencing for basketball courts is a convenience and safety feature. It will help to keep the ball in play so you don’t have to go chase the ball after every missed shot. It will also keep children out of harms way by keeping them in the playing area away from the road. The fencing will also make your playing area look more professional and high-class. Some do a partial fencing job while others enclose the whole basketball court. If you are interested in basketball court fencing, call us today.